[MECCG] Middle Earth: The Wizards, What is it? this thread is only to explain with some more details what this game was. It was the collecting card games released by ICE in addition to the MERP roleplaying games. The Original Game is the set called "Middle Earth: The Wizards" with more than 350play cards, among which one of the rarest was , indeed, "The One Ringe" card. In this game you were to play one of the five Istari and gather fellowships (a big one or several smaller ones) and travel through Middle-Earth to gather points (earned with famous items retrieved from hoards, or by having factions join your cause) or to try to use a strategy to destry the One Ring (which was by far the hardest way to win the game because it supposed you had quite a bunch of the rarest cards of the game to play the good combination of cards. With those two sets in existence you could now have access to new game rules sets if you want : You could play a ME:TW deck against a ME:LE set.... playing an Istari againt a Nazgul! that was grand! Another addon was released after ME:LE, it was Middle-Earth : Against the Shadow and it was , if I remember well, fit for both ME:TW or ME:LE sets with items, ressources or hazards for both types of decks. The Final One : Middle-Earth: The Balrog.... it consisted of Two fixed decks instead of blisters.... the content of each of the two sets (one green-blue, one red) did not change from one package to the others. 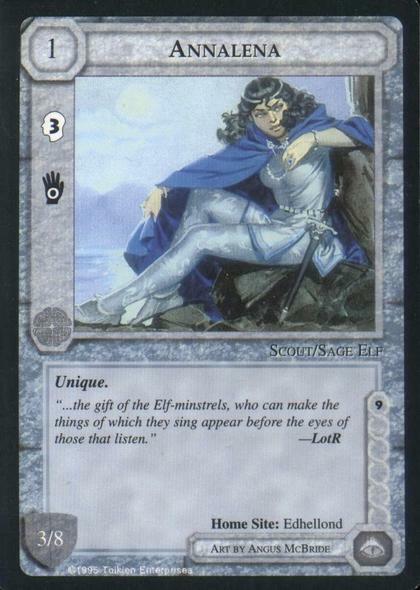 It included a bunch of former released cards from former sets or addon, with gray borders... and a lot of cards specific to the Balrog release... Including the Balrog Character card (actually the rule of this set was that you neither played an Istar, or a Nazgul... you were playing "Durin's Bane" Balrog and you were looking for power over Middle-Earth without serving the good cause or Sauron's cause. It's interesting to see the visual "cross-over" between Mithril and the Wizards game - I was struck recently by the illustration of a Woodman on a card. The entire outfit is inspired by the Mithril figures. Of course the MX Fram figure is directly inspired by the card illustration. I was pretty amused to realise your "profession" convention for MMP was inspired by the Wizards game. I fully approve! Oh, I know. It's just interesting. As an aside: do you have a scan of the "Annalena" character card? Sounds like someone I'd want to create via conversion and painting. (Edited:) Sorry for the 403. Search at the site of the link posted by Master Gildor above. . . " bad link" , Ben. Would you try to post this link again please. Hope the picture is visible now? 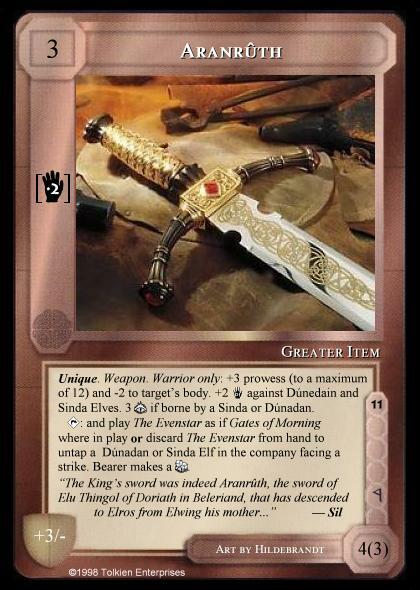 Master Gildor posted the link to a card search engine, above. 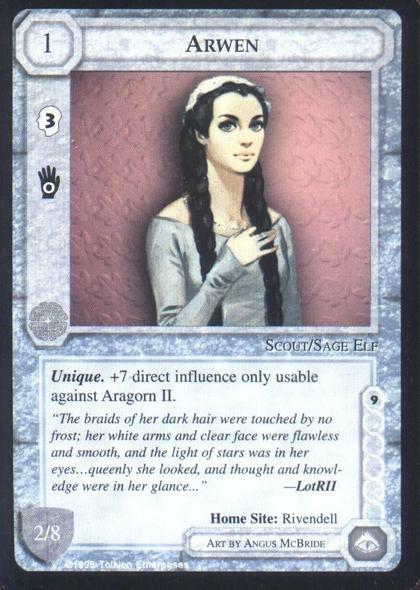 One should also adore this impression of Arwen. Nice cards. I think i'm going to have a closer look. Thank you kindly - I found the image after taking the card number and searching around the site. 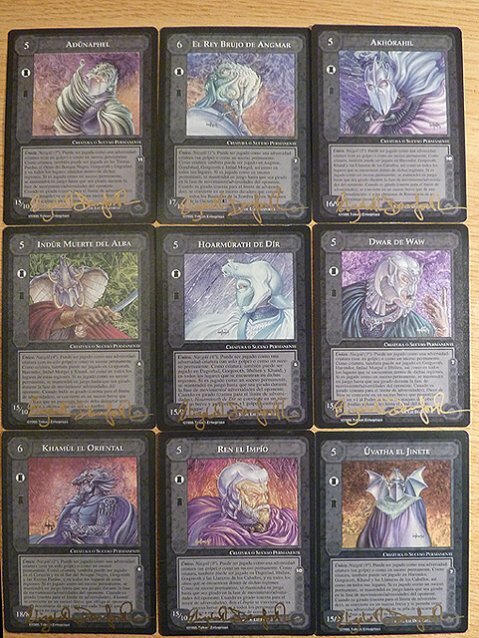 The artist who draw the nazgul's cards should be known for those who played MERP, because she was one of the illustrators of the MERP books!! so here is the link in between them. Liz Danford was also an illustrator for some cards of the METW card game, on wich I spend lots of summer nights with some friends. It was a really nice game. Still have the card collection complete!! if there are any people interested I could provide more info Maybe Gavin would like it? Very good news, I have been MECG players for years. May you provide me more info on this. I would be very interested on it... When this game was working well in Spain (distributed by Joc International , at already disapeared entreprise) I was Istari (tournament organizer) in my country... It will be nice to get news of this so please tell what to do to put my hands on this two sets. So Thingol, what do you think about your own sword? My brother once proposed to offer me the full limited wizard 1st edition he has. I could not accpet by that time knowing the time it took him to get the all set (it was back in 1997, no internet ebay thing at that time). I wonder if I should come back to him about this. First I shall achieve my mithril collection. Totally agree with you Gildor: the real problem of METW was the time to finish a match, otherwise is a beautiful game. I have the complete sets in spanish, but not "The Balrog" because it wasn´t edited here - I didn´t bought at the moment because most of my friends have stopped playin' when The Balrog comes out. Now we are trying to play it again, I keep you in touch about Dreamcards sets if I finally acquired them.